The Garden Terrace & Bar is our smaller space and holds a total of 65 people, which includes comfortable seating for approximately 40 people. This space is made up of two distinct areas, the Bar and the Garden Terrace room. Additional tables and chairs are available for a rental fee of $50.00. Please view our rental policies, which include information regarding our strict ABC License policies. Please contact us for availability, voting member pricing, and detailed rental information at fsbcdirector@frysspring.org. 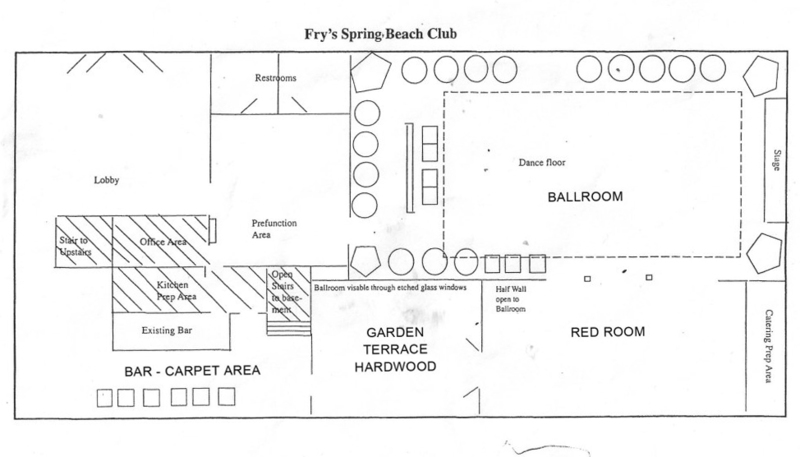 Wooden Floor: 32'1" x 26'9.5"
Width from Wall to Bar: 11'5"
Please explore our available facilities and rates, and read more about our rental and ABC terms and policies and floor plans.